The most common problem RV owners complain about is probably a leaking roof. A leaking roof can quickly destroy an RV and yet most people don’t know how to fix them. In fact, you’ll find many used RV’s selling as-is for dirt cheap prices just because they’ve suffered from a leaky roof. Fortunately, an RV roof can be fixed pretty easily. How do you fix a leaking roof on an RV? Identify the source of the leak. Apply a temporary fix until you can make a permanent fix. One thought to keep in mind is that there are a few different types of leaks you may develop and each type of leak will need a different fix. Also, different RVs will have different types of roofs and each type of roof will require different materials to repair it. How Long Does an RV Rubber Roof Last? Does Camper Insurance Cover Leaks? Do Solar Panels Make Roofs Leak? In this post, I’ll give you step by step instructions on how to fix 9 different types of RV roof types. But first, we will look at what you do first as you find out the roof is leaking. We will now walk you through the 3 steps of fixing a leaking RV roof. The first step has a preventive aspect as well. While we inspect the roof for leaks we will locate any existing leaks as well as make sure we stop any future leaks as well. Let’s start by diving into how we inspect the roof on the inside as well as on the outside of the RV. One way to help prevent future problems with your RV is to do regular roof inspections. This should be done from the interior as well as the exterior of your RV. Inspecting for roof leaks will help you catch problems before they become larger problems. Catch a roof leak early and you will spare your RV from expensive structural damage and you’ll ensure that the items you keep inside of your RV won’t get ruined in the rain. Most RV manufacturers recommend that you inspect your RV’s roof at least once a year. If you use your RV a lot or store it outside, I’d recommend that you inspect the roof as well as everything else at least twice a year. Do a full inspection at the beginning of the season and do another full inspection at the end of the season. If you’re going on a long vacation, you may even want to inspect your roof the weekend before. This will help ensure that you don’t spend your entire vacation fixing leaks in your RV’s roof. The easiest place to start an RV roof inspection is from the inside. Start off by taking a look at your RV’s ceiling. If you notice any new or old water stains then you know you have a leak somewhere. This being said, not all roof leaks show up on the ceiling. For this reason, you may have to check the interior walls as well as the outer edges of your floor. The reason for this is that some leaks will run to the side of your RV and down your RV’s walls. These leaks may be identified by a soft floor or a water stain on your RV’s wall. If you find any signs of a roof look in the interior of your RV, you’ll have a better idea of where to look for the leak when you head up onto the roof. An exterior inspection should ideally take place on the roof. However, not all roofs allow you to stand on them! If you don’t see a ladder leading up to your RV’s roof, you’ll probably want to see your manual or check with the manufacturer to see if it can support your weight. If you can’t climb up onto your roof, you can always take a look from the safety of a ladder or a scaffold. Scaffolding is easiest but it is also more expensive when compared to a simple ladder. When you’re on the outside, look for depressions in the roof or other signs of visual cracking. Pay particular attention to areas around the vents and any rooftop HVAC systems. These areas are prone to leaking as the sealants that go around them are likely to dry out over time. If you’re lucky enough to have access to your RV’s roof, check for soft spots. Just be careful as a soft spot could indicate that roof has taken on a significant amount of water and it may no longer be safe to stand on it. After encountering a soft spot, you’ll probably want to go back inside to see how much damage has been done to the roof by pulling back any part of the ceiling that is obstructing your view. This could entail taking off the interior ceiling panels and removing any insulation between the roof and the ceiling. All of this will need to be done anyway, so you might as well do it now so that the roof has a chance to dry out and you have a chance to see how safe your roof really is. It isn’t always possible to completely repair a roof at the first sign of trouble. This is especially true for roof leaks that show up while you’re on vacation. Not only this but sometimes we just don’t have the time or money to fix our RV roofs right away. This doesn’t mean we should just let the problem go unchecked though. Take a few moments and spend a few dollars to apply a temporary fix and you’ll at least stop your problem from getting worse. The easiest and quickest fix you can apply to your roof is to simply put a tarp on it. To tarp your roof, you’ll just need a big tarp and a set of ropes or bungee cords to hold the tarp down. Make sure the tarp is pulled tightly down over your roof or it will get pulled up by the wind and you’ll end up with a big sail overtop of your RV. Poorly tarped lightweight RVs can actually be blown over in high winds. Once you’re RV is tarped, do not run your HVAC system or kitchen appliances. You may be blocking vents with your tarp and this could cause co2 to build up inside of your RV, a fire to break out, or your RV to leak even further. In extreme cases, you may want to glue tar paper down onto your roof. Tar paper does not cost much and it does provide a nice barrier for your roof. To apply tar paper, just clean your rooftop and follow the directions that come with the paper you purchase. Once you’ve completed one of the steps above, you’ll want to dry the interior out as thoroughly as possible. An electric heater, a good dehumidifier (we recommend these two! ), or heavy-duty fan can help speed up the drying process. Drying out your RV will help reduce the chances of mold and mildew forming inside of your RV. As soon as you’re able to make a more permanent fix to your roof, you probably should. The rare exception to this may be if you live in a desert that hardly ever gets rain. In this case, you may be excused for deciding to leave the leaky roof unchecked. However, do keep in mind that water can run from your rooftop AC unit so any leaks around this area may continue to occur even if your RV is never exposed to the rain. You may also have a hard time reselling your RV as nobody wants to buy an RV with a leaky roof. Let’s proceed and look at how to fix each type of roof. Here’s a quick list of the 9 different types of roofs we can have on our RV’s and Campers. These are the 9 types of roofing we will go over in order to point out how to fix each of them. A popup camper roof leak can come from one of two places. It can leak through the canvas roof area or the fiberglass roof area. We’ll talk about how to fix a fiberglass RV in the next section and cover fixing the canvas area in this one. Canvas roofs will leak from the seams or from holes in the canvas. Small holes in your canvas roof can be patched using patch kits. You can usually purchase aftermarket patch kits at RV supply stores. Larger holes may call for an entirely new canvas replacement roof. This can get costly and I’ve seen pop-up canvases sell for over $1,000.00. In fact, if you ever want to buy a cheap trailer, look on Craigslist for old popups with bad canvas and you’ll see all sorts of inexpensive trailers. For seam leaks, you can apply sealants to the seams which will usually hold for a season or two. The sealant is inexpensive so it is a good idea to re-apply it every 6 to 12 months. Another alternative for fixing leaks coming from seams is to use seam tape. Seam tape can be applied to both the interior and exterior of the canvas and you’ll probably need to replace that each season as well. A solid fiberglass roof will only leak if there is damage to the roof. In most cases, a fiberglass roof leak comes from areas where the fiberglass has been cut into to add on items like overhead fans, HVAC systems, etc. We had a leaking roof in our first fiberglass RV because we mounted something in the ceiling (forgot what it was – maybe a lamp). Fiberglass roof structures can become cracked and water may run in through the cracks. They can also have holes put through them which is a more obvious roof leak to fix. For leaks around vents, take off the vent and re-apply the sealant before putting the vent back on. Sealing tapes can be placed underneath of the vent to act as an added layer of protection. Also, before taking the vent off, make sure the leak isn’t coming through the vent itself. If you have a cracked vent cover, you may just need to replace the cover as the sealant may be just fine. Unscrewing and replacing a vent cover is a lot less work than replacing the entire vent. For holes and cracks in the fiberglass itself, you’ll either need to find a fiberglass repair shop or learn to fix fiberglass yourself. Some holes and cracks can be repaired using Bondo. Anybody who knows how to work with Bondo on automobiles will be able to help you with this. For larger holes, you may want to add a new layer of thick marine fiberglass cloth. Epoxy resin is stronger than polyester resin but polyester resin is more likely to match the original resin that was used to make your fiberglass camper. An aluminum RV roof can leak from the vents, from the rivets, or from a hole in the aluminum itself. It can also leak around dents that have formed close to the interior ribbing of the RV. This is quite common with leaking roofs on Airstream Trailers. Fixing an aluminum roof leak may be as simple as applying sealant around a leaking rivet or as complex as having to replace an entire aluminum panel. If you’re inexperienced with working with aluminum sheeting, you may want to hire a professional to do this for you. This is especially true for aluminum RVs with complex curves like Airstreams and vintage Spartan campers. Aluminum sheet roofing is much easier to repair. You can buy entire new sheets and use them to replace any sheets that are damaged. Alternatively, you could cover the entire roof with an alternative roofing solution. Some people will convert their vintage metal RV roofs with rubber ones by coating the aluminum. 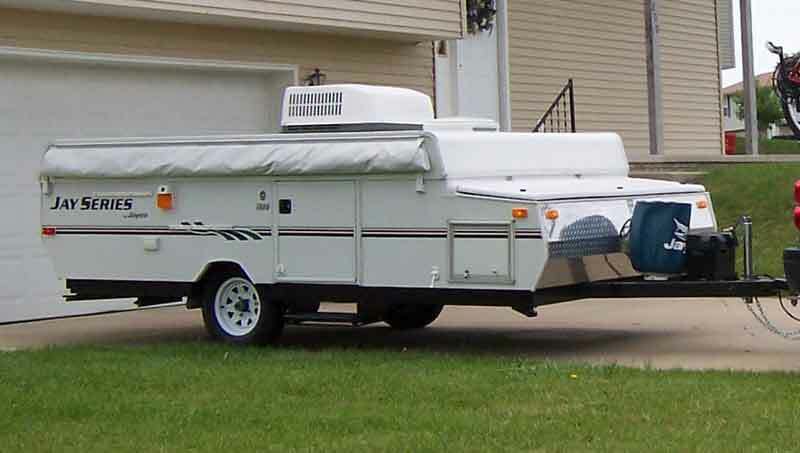 This new rubber membrane can then be painted to match the RV giving it a unique look and a newly sealed roof. Just keep in mind that once you’ve changed the roof you won’t be able to consider our vintage RV a restored RV any longer. At this point, your vintage RV will just be considered a vintage RV that has been remodeled. A vinyl roof is usually just a wooden roof with a vinyl coating over top of it. Some people consider campers made from wood and filon fiberglass sheets to be vinyl roofs as well although they do differ. These roofs can be torn or punctured and seem to be less durable than many of the other roofing options on the market. In the case of a vinyl roof, your best bet may be to just replace the vinyl panel. Alternatively, you could apply fiberglass or even a rubber coating to the top of your damaged vinyl roof. You’ll rarely see a roof that is made from just wood. Typically all wooden roofs will only be found on historic RVs and DIY RVs. Wood does not make a good roofing material on its own and it will leak around any screws or nails that have been used to put it in place. If you have a wooden roof on your RV, you may want to change this by replacing it with a more traditional type of roofing material. Otherwise, seal the areas around the screws and nails and protect any corners or seams with trim. Replace any wood panel that is starting to show signs of rot and repaint any areas that haven’t been recently painted. I’ve built small RVs using corrugated plastic as my roofing material of choice. If laid properly, corrugated plastic is a great lightweight roofing choice. The main causes of leaks with these types of roofs are usually the screws used to mount the roofing or the overlapping areas of the roof. Start off by checking to see if the roof is set up the way the manufacturer specified. Corrugated roofs need to have a certain amount of overlap and the corrugations need to be running in a certain direction. If you’ve installed your roof properly it may just be that the roof is leaking around the screws. Special screws need to be used with this type of roofing and they are expensive to buy. If the leak is originating from around a screw, go ahead and replace it and place sealant on and around the screw when you do. When the roof has been installed correctly and the screws are all leak-free you shouldn’t have any problems. This, of course, is assuming you do not have any cracks in your panels. Cracked panels cannot be easily repaired and should be replaced when necessary. Rubber RV roofs have become increasingly popular. These types of roofs are relatively light-weight and they age very well. They’re also easy to apply to existing roof structures so many people will apply them right over top of their existing leaky roof. There are three main types of rubber roofs that people like to use on their RVs. The first is usually just a quick fix that comes in the form of Flex Seal. This product can be sprayed on like spray paint and I’ve read many mixed reviews on the product. This being said, there are more advanced liquid rubber roof products that you can buy to apply to your roof. Liquid rubber RV roofing goes on just like paint. However, once it dries it ends up hardening into a rubber membrane. This paint on rubber roofing material usually comes in either white or black but you can paint over top of it. The benefit of applying this type of roofing is that you do not have to take as many steps to apply it as you do to apply the roll-on types of rubber roofing and you can control how thick it will end up being. You can also apply it over top of most other types of roofs so you won’t need to tear off your old roof to apply the new liquid coating. The other two types of rubber RV roofs are EPDM roofs and TPO roofs. Let’s take a further look at each of these types of rubber RV roofs below. The acronym EPDM stands for Ethylene Propylene Diene Monomer. Whoa, no wonder people stick to referring to this material as EDPM. “EPDM is an extremely durable synthetic rubber roofing membrane widely used in low-slope buildings”. If you’re wondering, most RV roofs would fall into the low-slope category of roofing. This simply means that they do not have much of an angle to them and are flatter than your typical homes roof. This type of roofing is created using a combination of oil and gas so I wouldn’t necessarily call this roof “green” by any stretch of the imagination. However, the fact that this type of roofing lasts so long may make it greener than other products in the long run as it does not need to be replaced as often. This type of roofing comes in a variety of widths and thicknesses. But most RVers will end up buying it in a thickness of 45 mils and they’ll buy it to match the width of their roof to make installation easier. How to Apply EPDM Roofing to Your Camper or Motorhome Roof? To apply EPDM roofing, clean your RV’s roof and remove the vents as well as the AC unit. You’ll want to reinstall them over top of the new roof once it’s been laid down. Next, apply EPDM glue to your roof and then roll the roofing out over your roof. Try to smooth the roofing out to reduce any air bubbles that might form. Keep in mind that you don’t have to glue the entire roof down at once. The glue will dry quickly so you’ll want to roll the roofing out in small sections so that the glue doesn’t start to set before you get a chance to lay the entire roof down. After the roof has completely set, go ahead and put your vents and AC unit back on and be sure to use sealing tape and sealant around them. It would be a shame to replace your roof only to cause a leak around your vents. Once this is done, you’ll just need to apply the corner trim and you’ll be all done. The acronym TPO stands for thermoplastic polyolefin. This is also a type of rubber membrane that can be rolled out onto the roof of your camper or motorhome. TPO can be painted using a specialized paint which gives you the ability to match the roof’s color with the color of your RV. Special sealants can be used to help seal TPO roofs. If you do not have a TPO roof and would like to install one, you’ll do so using the same methods we talked about in the EPDM roofing section. The difference will come in the way the roof is adhered to the roof and at the seams. TPO allows for heat welding so you can use a heat gun to soften the roofing material which will then harden as it cools. This creates an incredibly tight seal that is very unlikely to leak. A rubber roof usually has an average lifespan of about 15 years. According to the manufacturers you can expect between 10 to 20 years from a rubber roof. The reason the roof lasts so long is that it is extremely resistant to UV rays and its roll-on design helps to reduce leaks from forming between layers like you might see in a standard shingle roof on a home or a metal roof on an RV or motorhome. Be careful when doing any sort of roof repair as a leaky roof may be suffering from structural damage. This is especially true of roofs built using wood. Standing on a roof with structural damage is dangerous as the wood may be so rotten that you may end up falling through it. Read this article first, If you are unsure whether you can stand on the roof of your RV or Camper. Before doing any roof repairs, check for structural damage and make those repairs first. There isn’t any point in sealing up a roof that is likely to collapse sometime in the near future. Structural damage can often be repaired just by replacing some of the plywood but sometimes load-bearing beams may need to be replaced as well. Most aluminum roofs aren’t structurally sound enough to stand on in the first place, so always do these types of repairs from a ladder or a scaffold. There are many reasons why an RV roof might leak and different causes have different solutions. RV roofs can be made from different materials and you’ll need to identify what type of material you have before making any repairs. Full coverage camper insurance will cover leaks. However, they usually will not cover leaks if you’ve caused them. Meaning, if you leave a skylight open and water damage occurs you may not be covered. If you tend to be forgetful, you may want to buy a skylight that automatically closes when exposed to water. You can read more here about what a typical RV insurance cover. A properly installed solar panel will not make your roof leak. This being said, an improperly installed solar panel will make your roof leak. Be careful to seal any holes that you create when installing your solar panels and you shouldn’t have any problems.